…most recently from Vienna, Austria, a city that can be summed up with classic, imperial and elegant. I was in town for a short three days attending the first Austria Destination Summit, a trade show for travel agents looking to learn more about the destination. I could bore you with tales from the private Vienna Philharmonic rehearsal, or the nighttime tour of Shoenbrunn Palace (which ended with a lavish banquet overlooking the city)…but I think I’d rather tantalize you with tales from the table. Night one: Champagne and hors d’oeuvres in Vienna’s iconic Ferris Wheel (the oldest in the world). 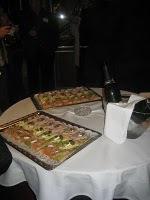 The Viennese absolutely love their smoked salmon, cheese or ham on bread. And as basic as it sounds, it does the trick. Creamy, salty smoked salmon with a dollop of creme fraiche on a soft slice of baguette. Sold. Then it was wienerschnitzel (lightly breaded and fried fillet of veal) with a squeeze of lemon and a side of scalloped potatoes, with a never-ending glass of crisp, white wine at Wagon 31, the restaurant adjacent to the Ferris Wheel. Did you know Vienna has a booming wine industry? Me neither…but I was not disappointed. 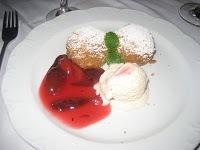 Dessert was loosely translated on our menus as a chocolate-filled dumpling with strawberry sauce. I’m not a girl with a sweet tooth, but man that sounded like a drug that I had to get my hands on. Diabetics: Avert your eyes. Picture a fluffy white cake ball filled with oozing, molten chocolate, crusted in shredded coconut and topped with gooey strawberry sauce. Night two: A private dinner in the wine cellar of Klosterneuburg Monastery, a Roman Catholic monastery just outside of Vienna on the Danube river. The working monastery is home to not only a cellar chock full of delicious Viennese wine, but it is home to the largest cask of wine in the world (56,000 liters!). Hey, heaven. The monastery capitalizes on this by offering guests the opportunity to literally slide down the barrel. 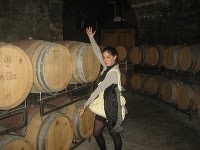 Needless to say, I could not resist after I had sampled a few glasses of the onsite libation. Night three: A feast for the senses and a true taste of Vienna. Our hosts rented out Cafe Gloriette, part of Schoenbrunn Palace, the summer residence for the Habsburg family. It was built in 1775 as a ‘temple of glory’ for Empress Maria Theresia. In 1780 it was transformed into a breakfast room for the Emperor Franz Josef I. Today it is an elegant restaurant boasting breathtaking views over Vienna. 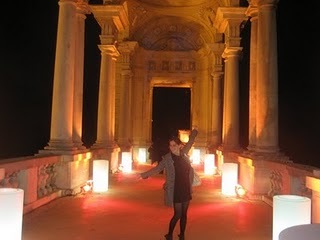 Arriving at night was an experience all its own as the building was set aglow with dramatic lighting. We entered to a quartet playing delicate Mozart (which later erupted into some sort of hypnotic blend of house beats with electric Mozart – odd, but it grew on me. Or maybe that was the wine). In any event I tucked into a Viennese staple: beef broth with soft dumplings, similar to matzoh balls. Following this we were served flaky cod and saddle of veal, all culminating with my favorite: oh yes, those chocolate-filled dumplings. What a gloriously calorie-filled bookend to an already overindulgent trip. Despite my waistline’s better judgment, Vienna has not seen the last of me.